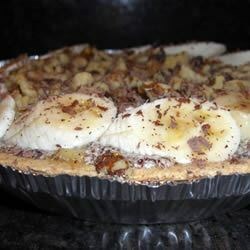 "Bananas, chocolate, and walnuts in a pie. Heaven! Garnish with walnuts, banana slices, and whipped cream. Please note: this pie contains raw eggs. We recommend that pregnant women, elderly, young children and people with medical or immune problems do not consume dishes containing raw eggs." Cream together butter or margarine and confectioner's sugar. Beat in eggs one at a time; beat for 3 minutes after each addition. Stir in vanilla. Slice 2 bananas, and sprinkle with lemon juice. Fold grated chocolate and bananas into sugar mixture. Turn filling into cooled pie shell. Garnish with walnuts, banana slices, and whipped cream. For more information regarding egg safety, read our Hints and Tips. This recipe was quick and easy to make and tasted exactly how I remembered from my childhood when my mom would make it for me! It was great! Outstanding! I never understand rude reviews.